Become a RUSTYCO ® dealer !! RUSTYCO ® RUST-SOLVENT is an extremely high-quality product and it will also emphasise the professional level of your company's entire product range. That is also why racing driver Tim Coronel recommends RUSTYCO ®. RUSTYCO ® has its origins in America and stands out from any other rust-removing product currently on the market. 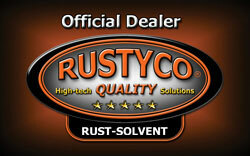 RUSTYCO ® RUST-SOLVENT is a resounding commercial succes at all our existing dealers. That is why a RUSTYCO ® dealership offers you many advantages. When you purchase a RUSTYCO ® dealer product range of 12×250ml, 12×500ml, 12×1000ml, 12×GEL 1000ml, you will receive the following for free!! A beautiful and durable shop display, a leaflet stand with glossy leaflets, weather-proof flags, stickers, dealer window stickers, handout stickers etc.